After Pressure Mounts, Joel Osteen Says His Houston Megachurch Is Open To Evacuees : The Two-Way Lakewood Church occupies an arena that used to house the Houston Rockets. Questions had circulated online about why it wasn't being used to house those needing refuge from Hurricane Harvey. Joel Osteen's Lakewood Church in Houston came under scrutiny for not opening its doors to evacuees from Hurricane Harvey. The former basketball arena seats 16,000 people. When disaster strikes, stories often emerge about people who go above and beyond to serve others. People like Mattress Mack, the Houston business owner who invited Hurricane Harvey evacuees into his two giant furniture stores, even sending out trucks to pick up people who couldn't get there. But if you're rich and powerful and you are seen as not helping as much as you could: Watch out. Osteen is the lead pastor of Lakewood Church, one of the biggest in the country. It draws more than 45,000 people to attend services each week. 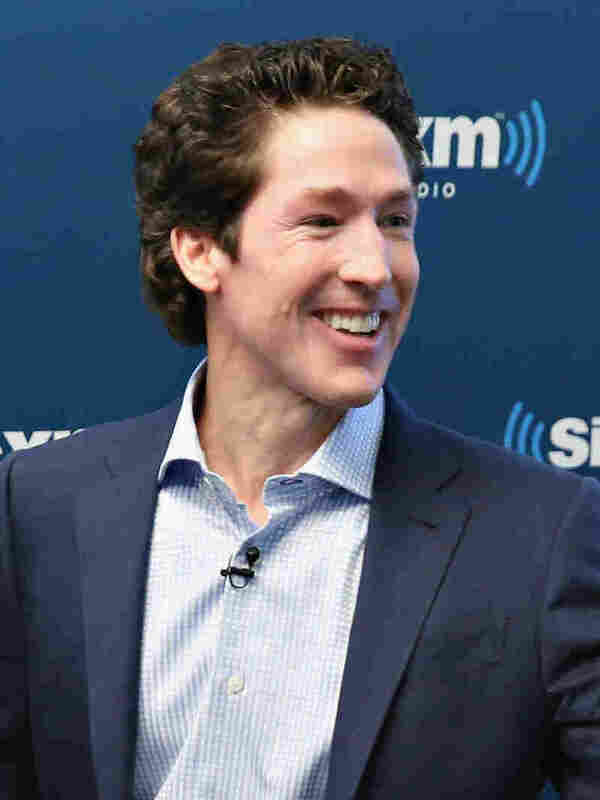 Millions more watch Osteen's sermons on television and online. Lakewood Church occupies a 16,000-seat arena that is the former home of the Houston Rockets. In addition to a sign for the church, its building also sports a logo that says simply "Joel." So after Hurricane Harvey began pummeling Houston, a Washington, D.C.-based writer and Army veteran named Charles Clymer wondered whether Osteen's church had a plan to help those struggling through the storm and its rising floodwaters. The church sits on higher ground alongside Interstate 69. "Curious about what @JoelOsteen's Houston-based megachurch is doing to help folks, I went to his profile," he tweeted. "Your guess is as good as mine." A screenshot showed that Clymer was blocked by Osteen's account. Others replied with screenshots of Osteen's recent tweets, lamenting that Osteen was "just praying" rather than using the church's building to shelter those who needed sanctuary from the storm. Appears he's just praying? Lots of "inspirational" quotes, you know, for those people checking twitter while waiting to be rescued. Lakewood Church had posted a message on Facebook Sunday morning that began: "Dear Houstonians! Lakewood Church is inaccessible due to severe flooding! We want to help make sure you are safe. Please see the list below for safe shelters around our city, and please share this with those in need!" Clymer wasn't convinced. He tweeted that he was "Currently attempting to confirm Joel Osteen's Lakewood Church in Houston is, in fact, flooded + inaccessible. Anyone w/ details, reply here." A few Houstonians went to the church and started posting videos of its closed doors and a vast, empty interior — whatever was visible from outside. H-Town, let the record show that Mattress Mack opened Gallery Furniture as a shelter but Joel Osteen kept doors of Lakewood Church closed. As criticism of Osteen grew online, ABC News shared a statement from Osteen on Monday evening, in which he wrote that he and his church are "prepared to house people once shelters reach capacity." "We have never closed our doors. We will continue to be a distribution center for those in need," the statement said. "Lakewood will be a value to the community in the aftermath of this storm in helping our fellow citizens rebuild their lives." The network posted photos sent by Lakewood Church that showed flooding in and around the church. "A source at Lakewood Church just told me they're planning to open their doors to Houston's homeless and displaced," Clymer tweeted Monday evening. "Finally." But despite Osteen's statement that the church "never closed its doors," as of 9:30 Tuesday morning, the church doors were indeed closed. Member station KUT's Jorge Sanhueza-Lyon tells NPR that a security guard was posted at the building, directing any evacuees to contact the city of Houston. "There was no sign of anything about to be open," said Jorge. "It just looked closed." Jorge noted that the church is an upscale neighborhood and was unlikely to be an obvious shelter to the people who need it most — unless the church made a point of inviting them. The church tweeted at 10 a.m. Houston time on Tuesday that it was "receiving people who need shelter." And Clymer, whose skeptical tweets put Lakewood under the microscope on Monday, remained skeptical. "I find it interesting Lakewood has used incredibly vague language to possibly imply flood damage but has provided no definitive statements nor pictures of the sanctuary or rooms being used for office space and storage," he wrote in an email to NPR. "It seems all of this would have gone away with a simple tweet with those pictures. Might have even been a great way to fundraise for flood victims." "What is a church if not a shelter?" he adds. "We worship Christ in the Sanctuary. It represents a bond of trust and fellowship (family) between the Church and the community it is commissioned to serve. That's not just metaphorical. The Church is also literally meant to be a harbor of physical safety." 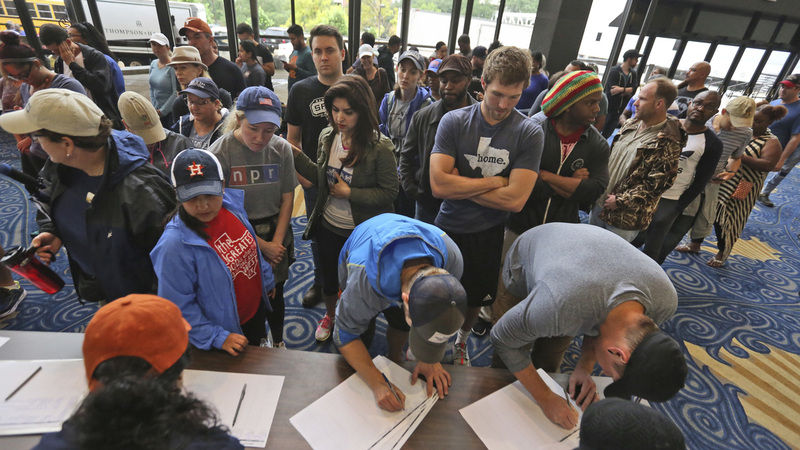 Volunteers sign up to help those seeking shelter from the flooding caused by Tropical Storm Harvey at Lakewood Church on Tuesday. 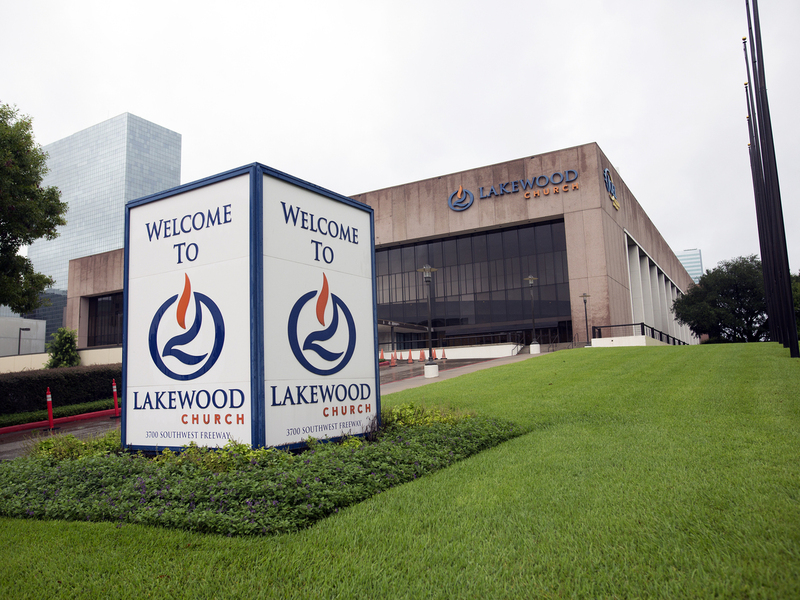 By Tuesday afternoon, Lakewood Church had opened its doors. Photographs showed volunteers lined up inside, sorting donated clothes and preparing to turn the church into a shelter. And Osteen addressed the criticism, albeit subtly. "Victoria and I care deeply about our fellow Houstonians," he tweeted. "Lakewood's doors are open and we are receiving anyone who needs shelter."